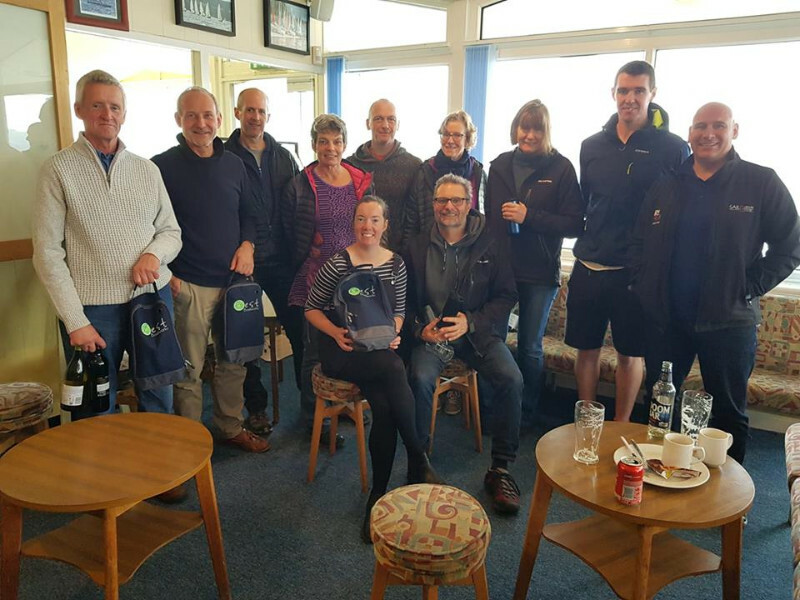 Chew Valley – southern tour kicks off. Saturday produced a fine but light dribble from the south-west, followed by a bracing 12-15kt North-Easterly breeze for the Sunday. Saturday’s light airs and glorious sunshine gave plenty of time to admire the rolling Somerset countryside, and the unique way it messed with the wind. Many unique comments were heard as the RS400 fleet tried to unpick its way up the first beat, and crawl back downwind without falling into the holes. Many tried, few succeeded. The dice rolling continued for two such races before the RO took pity and finished up for the day, promising a much better, if mildly less relaxing day on Sunday. The fleet retired to Cheddar gorge for a pre tourist-season meal, a few beers and traditional passing of the hindsight specs to better reflect on the day. The Black Dog Saloon in Cheddar stood out from the pack of traditional country pubs with its welcoming Western-style swing doors and acres of space, which was nice. The next day dawned grey but with a fired-up fleet ready blow away the opposition, which is fortunately what had happened to the previous day’s horde of winged spectators. With the wind in the opposite direction, and significantly stronger, the event effectively restarted, with some highly competitive starts and exploratory approaches to the first beat. The right-hand side appeared to give some early gains, but downwind gust-spotting proved to be decisive. Sean Cleary and Annalise Nixon of Farmoor SC appeared to figure it out better than most, with some very consistent performances and enviable boat-handling, much to the collective admiration of those who were still shaking off the rust from the winter recess. Steve and Sarah Cockerill were also putting in a good show, having led overnight from the previous day’s fun, with a few others competing hard for the front few places, including Jon and Nicky Heissig, who had elected to miss the first day, Steve Restall and Chris Stubbs from customs-enclave of Folkstone, and Mick and Sarah Whitmore from the independent republic of Eastbourne. Going into the last race it was still all to play for, but yet again, Messrs Cleary and Nixon stomped away from the fleet, and with the Cockerills managing an uncharacteristic 4th, Sean and Annalise finished the event two points clear to bring home a worthy event win, the Cockerills, second, and Howard Farbrother & Lou Hosken from Queen Mary sneaking into 3rd. Next stop Queen Mary for a set of Sprints!